ALRIGHT. If you follow me on Instagram, you know that I have been on a massive hunt for a vegan version of mini eggs. While I haven't found them yet (I still have hope that they exist! ), I've received a bunch of messages of people trying to help and telling me their favourite vegan Easter treats. Since Easter is a fabulous holiday designed for eating an insane amount of chocolate, I'd thought I'd share my information so we can all eat treats until we puke this weekend (you're welcome). Please let me know if I've missed any, and I'll keep adding to this list! 1. Sweet Hart Kitchen - they have deliciously natural treats that you can bring to your (non-vegan) family for dessert, and they'll love them. You could pre-order with them up until noon on Wednesday, but they always have treats on hand in the shop! And you can always try to email them to ask if they have time to make something special for you. I'm bringing the Lemon Curd pie to my Easter dinner on Sunday, and I'm so excited! 2. Lindt Dark Chocolate Bunnies are vegan. Enough said. 4. Good Rebel has those big hollow chocolate eggs filled with treats that we used to get as kids - they're shipped in all the way from England! 5. Whole Foods and Noah's have a whole variety of cool vegan chocolate options! If you don't have much time, you should definitely stop in here and you'll find something tasty. 6. Tori's Bakeshop has made their own version of Cream Eggs that look INSANE. They also made Cream Egg cupcakes. (Tori's also offers DELIVERY from M-F, soooo you should probably get these). 7. Apiecalypse Now had preorders for desserts to bring over to your family, but I think it's too late to order them... may as well try though! 9. A brand called LiveOnChocolate makes Coconut Cream Eggs that I hear are delicious, and are available at a few place around Toronto. 10. 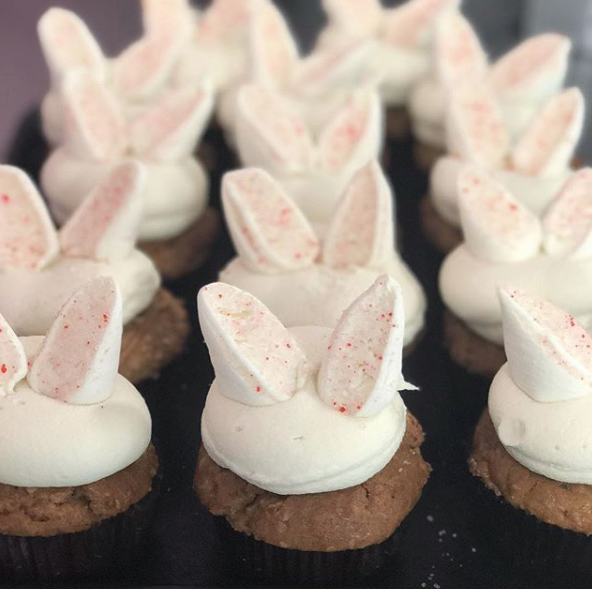 Bunner's just posted on Instagram saying that they'll have Easter treats available all weekend - just LOOK how cute these cupcakes are!! My husband took the reins on the menu choices (since it's his mom), and he killed it. I suggested he take a look at Minimalist Baker, since her recipes are all less than 10 ingredients and really easy (and delicious), and he said he had very hard time picking just one recipe! He settled on the Crispy Peanut Tofu & Cauliflower Stirfry, and it was SO GOOD. My parents aren't vegan, so I wanted to make a meal that wasn't going to be filled with fake vegan products like tofu meat, and heavily processed vegan cheeses. I wanted to make dishes that were vegetable based and had simple ingredients - I'm so happy with what I decided to make! Does anyone else crave consistency? I've eaten pretty much the same thing for breakfast for the past two years, and I don't see myself stopping anytime soon. I am an oats addict. Can't stop, won't stop, never want to stop.